Discover the Orthodox Jewish world with an Orthodox tour guide! Join this fascinating experience that will take you deep inside the Jewish-Orthodox reality in Jerusalem. 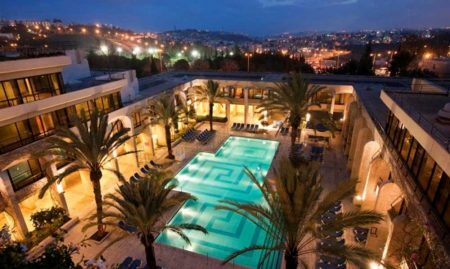 With this tour, you will learn about the Orthodox way of life, the culture, and the core values and beliefs of this unique community – all at first hand! “Outside the Box Encounters” Tours are a part of a unique social venture that facilitates encounters between the secular and the Orthodox societies in Israel and allows access to a close yet distant world. Start your journey at Davidka Square with a short talk about the Jewish Orthodox world. Continue to Zichron Moshe neighborhood with its beautiful alleyways and learn about the synagogues, the houses, the spirit of the place, and its everyday life. Follow the pashkevils – the famous street posters. Learn about how media and communication work in this community. 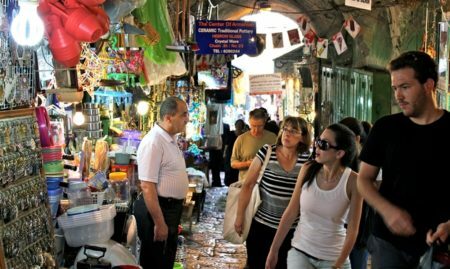 Get to Malchei Israel Street – the center of commerce and entertainment of the Orthodox community in Jerusalem. Walk down the main street and stop by fashion shops, music stores, bookstores, Jewish food joints, and Judaica stores. Meet the residents and learn about their unique world. Visit Kikar HaShabbat (Sabbath Square) – the heart of the neighborhood. This place used to be a center of protests and political activity. See the entrance gate to the famous Mea Shearim neighborhood. Taste some delicious traditional Jewish food! The tour takes place at Jewish Orthodox neighborhoods, and therefore, participants are asked to dress modestly. Men should wear shirts with sleeves and long trousers or 3/4 length trousers. Women should wear shirts with sleeves and with no cleavage and long skirts/trousers. Groups and individuals are welcome to sign up for the tour. The tour can be booked for private groups during other days of the week. Call 072-3944699 for reservations or contact through email/Facebook.